Membership is not a requirement to participate in the APPL. However, there are enhanced benefits for members. These benefits include reduced fees for tournaments, guaranteed play at all events, and complimentary APPL membership items. Also, only APPL members are eligible to win major prizes at the end of season sweepstakes drawing. Membership for the APPL is limited to 31 members. There are "guest spots" which will be available at all APPL tournaments, as detailed below. Any non-member wishing to participate in a APPL tournament must be invited (sponsored) by an existing member to be considered. Requests for invitation will be accepted no more than 14 days and no less than 2 days prior to a scheduled tournament. A guest spot will not be considered verified until a confirmation has been sent by an authorized APPL representative. NO requests received within two days of the scheduled event will be authorized. For a typical Saturday tournament, approval must be granted by the end of the day Thursday. There are two guaranteed guest spots for each event. Additional guest spots may become available as members notify the APPL administration of non-attendance at an upcoming event. Available guest spots will be filled first by guests which did not attend the previous event. Any non-member attending without proper notice will not be allowed to participate. Any league participant may host an event, but should have at least eight (8) games in good working order. Tournament game line-up is to be submitted to the APPL administration one week in advance of the tournament date and is subject to prior approval by the APPL administration. The APPL administration will publicly announce the proposed game line-up approximately one week in advance of the tournament. Hosts and administration reserves the right to add or remove game titles from the announced list at any time prior to tournament start. The chosen games should not include any potentially “marathon” games. All APPL tournaments will have a 1-hour warm-up/social period starting at 1 pm, followed by a players meeting, with the tournament starting at 2 pm. Hosts should have their games set-up, adjusted correctly, and tested prior to the tournament. The APPL administrators will provide a list of prerequisites for hosting a tournament. Tilt warnings are to be set to the factory default adjustment. All hosts will receive a $200 reimbursement at the conclusion of the tournament to offset expenses. All spectators must be respectful of the tournament and be aware of their surroundings so as not to cause delays in tournament run times. If a spectator is found causing delays they will be given a warning. If a spectator fails to heed this warning, a second warning will not be given and they will asked to leave the 'tournament game area’. These Rules, Regulations, and Responsibilities have been put into place to help keep the tournaments running smoothly and to keep breakdown problems to a minimum, which will ultimately keep everyone happy and having a good time at our events. Your participation is much appreciated. Please take the time to make all necessary repairs to your games at least two weeks in advance of your tournament. This will allow you time for repairs and multiple play-test opportunities. If during any tournament the amount of games drops below eight games, the tournament will be canceled and all scores removed from the standings. If you need any help with game set-up or other preparation please contact us. Tournament games should be set in “Tournament Mode” or “Contest Mode” whenever possible, and 'Game Restart' must be disabled. Any games that allow a “buy-in” or “buy an extra ball” feature must have these features disabled. If a machine is set to award a replay, the award should not be an extra ball. Extra balls rewarded for attaining certain score levels are not allowed. All solid-state games should be set for 3 ball play unless normal ball times are very short. EM pinball machines that do not allow for easy selection of this feature may be left at 5 balls per game. Any tournament game that goes down with a problem during tournament play will be allowed a 10 minute repair time. If proper repairs can not be performed within this time frame then the game will be excluded from the tournament and all scores for this title removed from the scoreboard. APPL administration team reserves the right to remove games from a host’s lineup which don't lend themselves well to tournament play. If a two-player game is accidentally started by a player and the first ball is plunged, he/she will not be given the opportunity to restart. He/she will continue to play as player 1 and plunge the balls for player 2 without using the flipper buttons. Players may opt to play a two-player game with another participant which has not already played the particular game for the tournament. No more than two players may participate in a single game (no 3- or 4-player games). Certain games which grant advantages (such as "lock stealing") should be played as single-player ONLY. If at any time during the game a player plays another players ball, both players will be given a score of zero for their score on that game. Fees are $15 per Tournament for Members during the season or $20 per tournament for all other players. 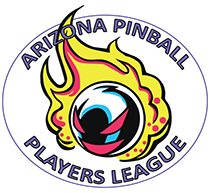 1st: $ 400, Trophy, and title of "APPL Division A Champion"
1st: $ 200, Trophy, and title of "APPL Division B Champion"
The balance of the purse will be used for the trophy fund and APPL administrative costs. The overall purse may be reduced if necessary to meet these needs. Excess funds will be added back to the purse. The winner of the "B" division must move up to the "A" division the following season they play in. Any player in "A" whose season total would not have garnered an award in "B" may choose to drop down to the "B" division for the following season. To be eligible for divisional transition, a player must compete in a minimum of 5 events over the course of a season. There will be no "early play" prior to tournaments or "make-up play" after tournaments. Participants should make every attempt to be in attendance at the start of the tournament. If a member or an approved guest is unable to attend a scheduled tournament, we ask that notification be sent to APPL administration as soon as possible. There will be a one hour warm-up periods which is not mandatory and may be skipped if the player wishes to forfeit this opportunity. Late arrivals may be denied a tournament entry if the league administration feels that the delayed entry would unnecessarily prolong the event. Late entrants must notify the administration if they will be late, and will not be allowed to start the tournament if arriving significantly past the scheduled tournament start time. During a tournament, all individual game scores must be validated. When a game is completed, the player shall record his/her own score, then request that the score be checked and verified by another attendee. The verifying person should ensure that the score is accurate and legibly recorded, and LEGIBLY initial the scorecard. Verifying INITIALS are required, NOT a signature.